As I'm sure you will have noticed, today is the seventh anniversary of the World Trade Centre attacks on 11th September 2001. 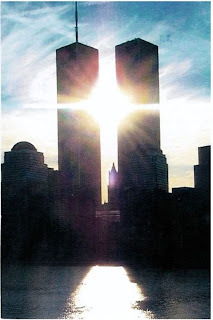 Nearly 3,000 people died that day: terrorists, passengers on the four hijacked planes, people in the towers and in the pentagon, emergency workers, bystanders.... It was a horrible day. "The worst day in America's history saw some of the bravest acts. Since 9/11 our troops have taken the fight to the terrorists abroad so we do not have to face them here at home. Thanks to the brave men and women and all those who work to keep us safe there has not been another attack on our soil in 2,557 days." I honestly don't know where to begin with that. The staggering lack of sensitivity and the tone of self-justification, even of self-satisfaction, is truly amazing, even for him. Perhaps it would surprise Mr. Bush to know that the 2,751 people who died in Manhattan on that day were not all American. In fact, more than 90 nationalities were represented. The attacks may all have happened on US territory, but this was a truly global event and the tremors from those impacts reverberated loudly around the world, not least because of the American reaction. To focus on this as a purely American event completely misses the point. 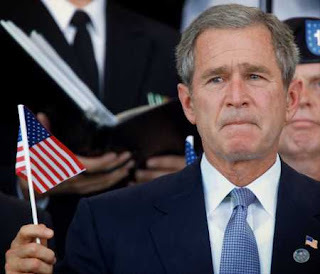 There may not have been another attack on American soil since that day, but are we really so blind that we can't see that a direct consequence of the 9/11 attacks was the retaliatory (and often opportunistic) deployment of US military power in Iraq and Afghanistan and no doubt on a smaller scale in all sorts of different places across the world? As Bush spoke grandly of a "war on terror", someone had to pay. Perhaps you might now feel safe from the threat of global terror in Idaho or Missouri or Ohio or in Kansas, but I'm sure you'd feel a lot less secure if you lived in Kabul or Bagdhad or Abu Ghraib or Guantanamo Bay. Hell, what about the 52 people who were killed in the attacks on London in July 2005? What of them? Is it only the deaths on American soil that are worth counting? And then there's the wars: 3000 died on 11th September 2001, but between that awful day and today there have been between 87,387 and 95,373 documented civilian deaths in Iraq. They may have toppled Saddam Hussein, but have the US led coalition found the links to global terror that they were looking for? Have they found any weapons of mass destruction? Have they found anything at all? In addition to all of those civilian deaths, there have been over 4,469 confirmed deaths amongst the Coalition forces, of which 4,155 are from the US military. Yes, they made the ultimate sacrifice and we should pay our respects to them, but what have those deaths achieved? Are we closer to world peace or further away? It's not just in Iraq either: another 1000 Coalition military personnel have been confirmed dead in Afghanistan too, and the UN estimated that the total body count in 2007 alone was over 8,000, including at least 1,500 civilians. Terrorists, it seems, do not have the monopoly on killing the innocent. Without in any way belittling the 3,000 people who died in the US on that day seven years ago, I would suggest that the cost of "taking the fight to the terrorists abroad so that we do not have to face them here at home" has been unacceptably high. How narrow an interpretation of "home." How broad a definition of "terrorist". An awful lot of people have died since that day, some of them American. Whilst we should never forget those who died on that day in New York, at the Pentagon and in a field in Shanksville, Pennsylvania, neither should we fail to remember anyone else, of any nationality, who has died since that day and as a direct consequence of it. It would be a fool who suggested that all of those deaths in the 2,557 days since 11th September 2001 had somehow made the world a safer place. Better said than I could have. ah yes. we never could've predicted the attack.... unless, of course, we had read the report "bin laden determined to attack in the us." but as we are all painfully aware, the majority of americans voted for the fuckwit. i am afraid of americans. The worst day in American history is when white people "discovered" it. I'm white and American Indian(yes I can legally own an Eagle feather and you CAN'T - oops now they'll steal that from me). The governments here are such an embarrassment, but as you can see, they're delusional about how this country got started, thus remaining delusional about it's current global practices. Karma? IDK, but we are a half and half land. Unfortunately, the half that owns the electronic voting machines is the half that acts as our mouthpiece. They will make it look close again in November, but sadly, things aren't going to change anytime soon. You missed my post in response to Laura Bush's comment at the Republican convention that her husband had kept Americans safe...of course, I focused on how that wasn't true for Americans, but really the world is a much more dangerous place since that day for most people. Interestingly, there was almost no coverage of Bush here, only the 2 candidates.